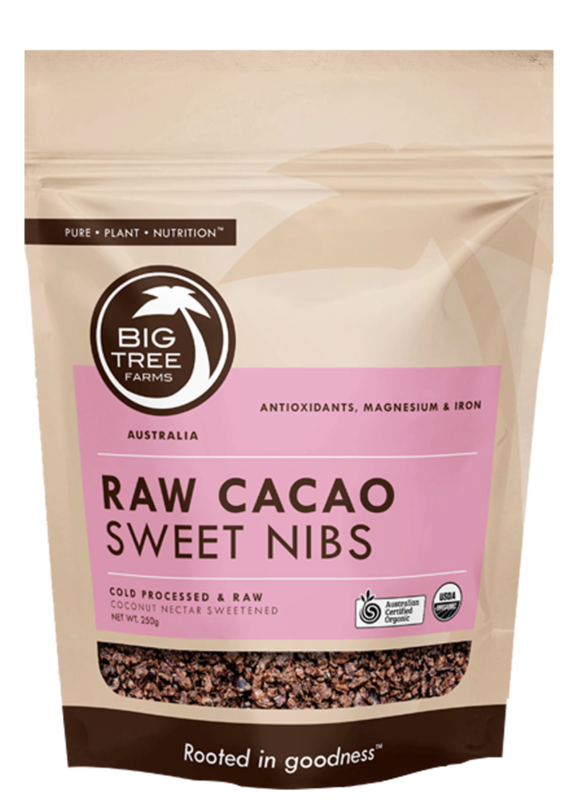 Truly raw organic cold-processed Cacao Sweet Nibs is mildly sweetened with low glycemic coconut palm nectar. It is the perfect energy source, super high in antioxidants and magnesium that keep your active body in tight working order while the mix of cacao “bliss chemicals” and organic low glycemic coconut palm nectar keep your mind and taste bud in a state of blissed out ambrosia. In addition to healthy and delicious snacking, use this in place of conventional chocolate chips for a healthful twist in all your kitchen creations. It is no other snack you have ever had! This is chocolate at its best. They’re little crunchy bits of goodness; chocolate that does not melt, easily portable, tastes amazing, energy boosting – your heart is happy, your blood is happy, your brain is happy, your soul is happy. This is Pure Living Food Nutrition, RAW integrity for the body and mind. Obviously… It’s ALL GOOD! A healthy and tasty alternative to conventional chocolate chips; add to raw and baked goods & confections (cakes, cookies); blended into smoothies & soups; sprinkle over fruit, yogurt, ice cream, granola, etc. Or just eat by the hand-full for a nutty and crunchy bite! Caution: This is a natural unprocessed product. Bits of shell may be present. Made in a facility that also processes cashews. Organic Cold-Processed Cacao Nibs, Organic Coconut Palm Nectar, Sea Salt.